I was worried I was going to miss them. 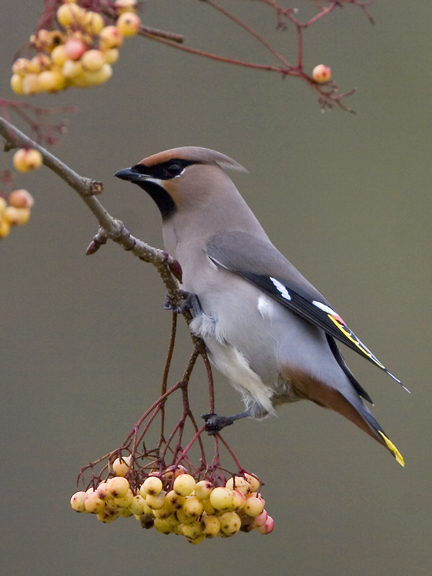 Since October there have been hundreds, possibly thousands, of Bohemian Waxwings in the UK. I know they make landfall along the east coast and spread out gradually, reaching us here in the west later in the winter, but I was beginning to fear I was going to miss out on a patch flock of these little crackers. I did catch up with 3 of them late last November, but they were fairly distant and only stayed around for a matter of minutes. Since then not much in the way of long-staying easily accessible birds. Until now! Got the word yesterday, late on, and made a not too mad dash up to see them. We were out anyway and they were not too far out of our way as we headed home. They gave us the run around though! Eventually caught up with them a couple of roads from where they turned up. Back today for another go. Late afternoon as I had a few chores first thing. 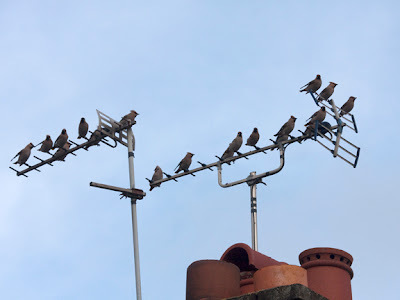 We get there and the birds appear right on cue, sat on the TV aerial of a house close to the Anchor pub in Irby. 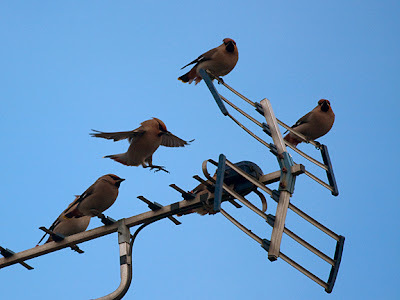 Whip out the camera to record the birds in their typically suburban setting. The wind is strong and buffets the group of 19 birds on the rooftop. They are constantly calling their soft trilling song as we stand on the road below. They don't hang around for long, tghey zoom off to a tall Poplar tree a couple of hundred meters away. A van being loaded up at the end of the working day is spooking them. Pictures could be tricky. We settle down to wait for them to return. The wind is cold. A jogger runs past the end of the road. Postie turns up to empty the pillar box the jogger has just run past. The birds come sailing in and land on the same TV aerial. There is a little jostling for position then things settle down. They are back up and then down to the berries on the tree in the front garden. If the owners aren't birdwatchers then the free show outside their living room window should go some way to converting them! A bang from the loading of the van sends them back up to the roof. For no apparent reason they all leave and head across the estate in the direction of the church they were spotted at 24 hours earlier. We wait some more. The jogger goes past again, this time in the opposite direction. On his way home. Time is running out and we must start for home too. The birds don't show for us again so the final picture is one from the archives. Still plenty of berries left on the tree so they should stick around. Fingers crossed we can head back for another go.